the mother temple of Bali. 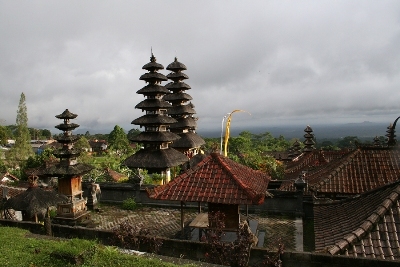 Besakih temple or Pura Besakih in Indonesian is the most important temple in Bali. Located at Karang Asem regency, the East coast of Bali. The temple is dedicated to Hindus God, Brahma, Vishnu and Shiva. To reach the place you have to go up to Mount Agung. The location is on 900 meters on the slope of this mountain. By the way Mount Agung is the highest peak in Bali. And you can even climb this mountain from this temple. This is the holiest temple in Bali. Make sure that you’re wearing a sarong. If you don’t have one, you can hire them or even buy it. It’s pretty handy if you have one. And if you’re planning to visit so much temple in Bali, it might be wisely to buy them instead to hire them. Pura Besakih was built thousand years ago or maybe even more, enlarged until became a large complex that you can see it right now. 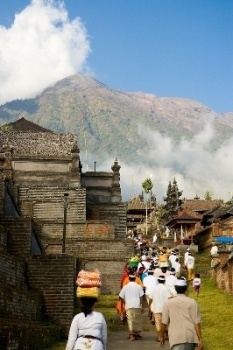 The temple was partly damaged by the eruption of Mount Agung in 1963. And restored in 1979. 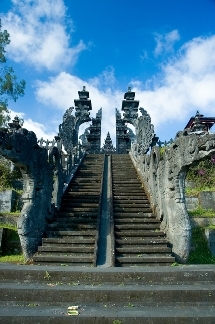 The temple held every year on the tenth month on Balinese calendar, mostly in April, a temple anniversary called Odalan. The perfect day to visit this temple with all the decoration and colorful dressed local people. But you can’t really enjoy the walking around the temple on this day, because thousands of people come to this place to held the anniversary. If you want to enjoy it without the crowd, don’t go to Pura Besakih on this day. But you can walk around the temple end and enjoy the spectacular view of from the top, of the incredible view of Mount Agung. Walk to the northeastern part, and you can get the best view. The temples spread out generously on the top of the mountain, it makes a pleasant walk, even if you can’t enter the temple, you can still enjoy the austere and magnifying of the temple. To reach the temple is not easy, it could be an exhausting experience. Because the bus or the cars doesn’t stop near the entry. You have to walk to get to the entrance of the temple complex. But the walking is certainly worth it once you’re up to see the amazing view of the temple with Mount Agung on the background. Simply beautiful….